We welcomed this day of gratitude in with a turkey trot this morning. 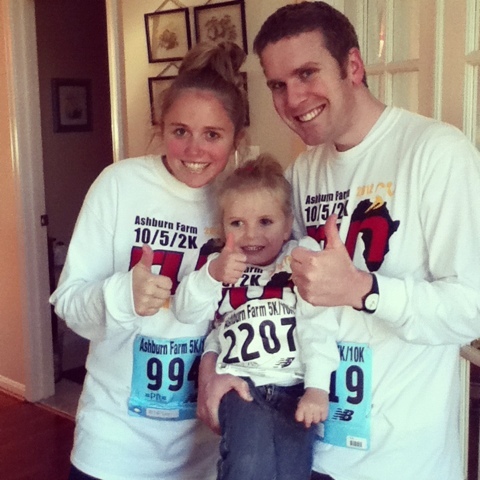 Bry and I ran the 5K with Bryan's mom and Olivia and Bryan's dad ran the fun run 2K together. It was fun! And Bry and I jogged the whole way without stopping or walking! We're pretty proud of ourselves. The rest of the day was, of course, spent preparing and eating our delicious thanksgiving feast. Mmm. I've been so good about eating healthy lately and my body wasn't really up for the big meal today, but I enjoyed it all the same. So grateful for healthy bodies and loving family and wonderful food. Not to mention a whole life filled with endless blessings. I love that we celebrate Thanksgiving as a national holiday. We have so, so much to be grateful for. You Lewis people rock! Congratulations...and happy Thanksgiving! so rosy and lovely! happy thanksgiving, kt. i hope you're wearing your mocs in honor. You're looking great! Keep up the good work! You look great! I so wish we could have ran this together! Mary and I ran that race many times in high school and college! :). Maybe next year we can all do it together! Also, you have motivated me to go running today. And I will see you soon!